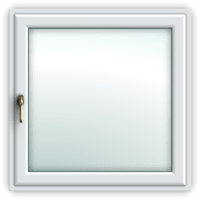 The Tilt and turn window is the window that can be opened both outwards and inwards with the support of upvc tilt and turn hinges on the frames or profiles. These windows come with two distinct features. One can either swing it in like a door or can tilt the top of the sash installed inside the room for ventilation purposes. There is an only single handle for both the operation. These dustproof and soundproof Tilt and Turn windows are used in the spaces essential simultaneously for ventilation and beautiful scenic landscapes like that in Living areas, kitchens and balconies. The 3 attractive colours with unique strength and durability make these Tilt and Turn windows from Weatherseal quite famous in the fenestration industry. UPVC Tilt and Turn Windows are the type of UPVC windows that can be opened inwards /outwards with the help of hinges Tilt and Turn on a frame. Our uPVC Tilt and Turn windows have sashes which come up with an updated modern twist and is built with the top quality Tilt and Turn hardware in order to make them very much easy to operate and last much longer and it can even be configured for opening inside and outside. The UPVC Tilt and Turn windows are suitable for different places where one might want to enjoy the beautiful scenery of the outdoors. The Upvc Tilt and Turn windows are generally made up of the durable materials which have a very amazing thermal as well as acoustic properties of insulation. These Upvc windows have a very beautiful design combined with the multi-locking points and which ensures total security. This kind of doors is best when it comes to providing ventilation for home. This is because it can be positioned in such a way that they will be able to catch a breeze and hence direct it inside your home. Weatherseal uPVC Tilt and Turn windows comes with different color profiles. These Upvc Tilt and Turn windows are a prominent type of door outfitting particularly for the individuals who need to catch the embodiment of old style charm. These upvc Tilt and Turn windows are perfect for spots where you need lovely continuous perspectives of the outdoors. These entryways are superbly for you to make space, let in outside air and surge your home with normal sunlight by having the capacity to open up a whole mass of your home. Whatever reason you have for your Tilt and Turn entryways, the weatherseal item gives a really dazzling other option to French or yard entryways. They have an ultra-slim sightline, providing rooms with a modern, clean appearance – and are available in a wide choice of opening configurations and different colours.